The first commandment is the key to sustainability: converting the waste biomass into useful methane under controlled conditions is the best way to tackle global warming. Conversely, as far as there is already available organic waste in a given territory, it makes no sense utilising arable land for energy crops. When bank clerks and capital investment groups evaluate a biogas plant they usually assume that any feedstock can be bought anywhere, in any desired quantity, at any time and at the same price for the next 20 years. None of these suppositions is true so many projects turn out to be complete failures, from both ecological and economic perspectives. Another dogma that proves deleterious for the sustainability of a biogas project is assuming that the scientific literature on biochemical methane potential (BMP) of different potential substrates are absolute physical constants for plant design. Organic matter is heterogeneous by nature, and the net methane yield of a given biomass depends on a long list of uncontrollable factors (soil, rainfall, species or variety cultivated, sunlight during the growth of the plant, how it was harvested and ensiled …). Frequently, the use of a certain biomass is artificially pushed by some company having a particular vested interest in selling the seeds or just because the plant designers are familiar with that type of biomass. A case in point is provided by corn, a plant that seldom yields more that 310 Nm3 CH4/ton of volatile solids (VS) while other substrates, for instance clover, can yield 319 Nm3 CH4/ton VS and common grass silage can yield 318 Nm3 CH4/ton VS. Nevertheless, the main biogas plant builders (mostly German) defend corn as the only substrate valid for keeping the plant running smoothly, on the base of their own (national) vision and experience that is not necessarily applicable to other geographical contexts. Electricity generation from biogas is another distortion introduced by the motor manufacturer and public utilities lobbies in Central Europe. Electricity cannot be (easily) stored and so electricity generation by biogas implies, in over 80% of the cases, that 60% of the energy value of the methane is just dissipated to the atmosphere as residual heat. Purified biogas, called biomethane, can fully replace natural gas and petrol for domestic heating, cooking, sanitary water production and as a car fuel. The combustion of biomethane is cleaner than many other petroleum-derived fuels, its carbon emissions are neutral, and it can be easily and safely stored in low pressure balloons or mid-pressure steel cylinders. Another aberration of European renewable energy directives is a lack of consideration of the local scale: for example, if a farmer has 10 hectares of land and just 20 cows, it is not logical to allow him to build a 1 MW electric power biogas plant just because “it is renewable energy”. In this regard, Germany, Spain and Italy are bad examples as there is no legal restriction on the size of the plant in relation to the size of the farm. This situation has resulted in the construction of biogas plants that consume all the crop produced in the farm, leading to the need to import fodder for the cattle, which means importing surplus nitrogen. This imported nitrogen adds to that already contained in the digestates (as anaerobic digestion does not consume nitrogen) so that some places are already showing symptoms of nitrification (underground water with increasing nitrites content and eutrophication of rivers and lakes). Finally, there is a misconception (encouraged by banks and investment groups) that the bigger the supplier of turnkey biogas technology, the safer the investment will be. In general the experience proves quite the contrary: big specialised biogas plant manufacturers often do not have their own construction workers and employ local contractors for the erection of the plant, keeping most of the commercial margin and having little or no control on the construction site, materials and quality of execution. 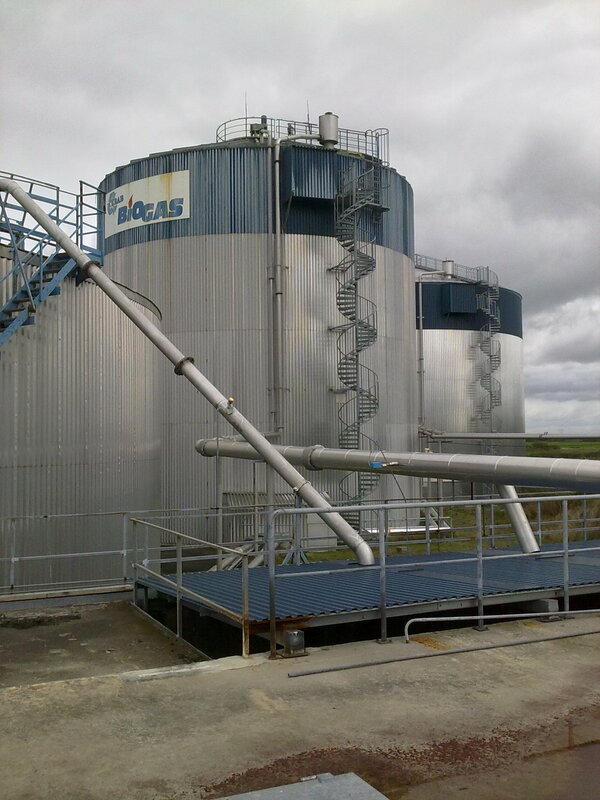 Anaerobic digestion, if properly planned, built and managed, is a technology that helps reducing the environmental impact of human activities, provides enhanced energy independence to local communities by partly replacing petrol, and constitutes a more natural way to manage the carbon:nitrogen balance of soil, thereby preserving its fertility. Degrading organic waste in a controlled manner helps reduce the propagation of disease and the pollution of underground and surface water bodies. The only necessary ingredient to benefit from all of these advantages is to design a plant that is perfectly integrated into local realities. Mario A. Rosato, CEO of Sustainable Technologies SL is an electric, electronic and environmental engineer, developer of advanced anaerobic digestion processes, professor of renewable energies at the University of Pordenone (Italy) and scientific journalist specialized in agricultural energy technologies. As part of its drive to increase the number of sustainability services it provides, BioLogiQ will be starting a collaboration with Dr. Mario A. Rosato. ← Happy World Wetlands Day! Pingback: Biogas: luci e ombre di una tecnologia promettente | BioLogic Blog | IL MONDO DEL BOSCO. Guardalo, sussurra e...pensa.